IEF supported Henrik Rasmussen, a researcher with Save the Elephants in Samburu, Northern Kenya, Africa, investigating aspects of male mating strategies in wild African elephants. 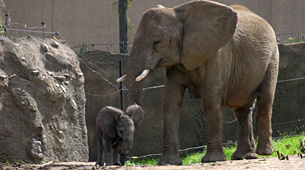 The social structure and reproductive decisions of male African elephants are still largely unknown. Large intra- and inter-population variations exist, possibly related to bull age structure, distribution, and density of females and competitors as well as other factors like land use and degree of protection. The aim of this project is to investigate the factors determining this overall complexity by investigating individual male reproductive strategies, associations, and reproductive payoff of bulls in a free ranging population of African elephants. To date, his research has provided insights into the behavior, movements, and habitat use of bulls in different reproductive states. This project combines detailed behavioral studies of wild bull elephants, whose age and social context within the overall population is known, with remote collection of movement data using Global Positioning System collars and non-invasive techniques for collection of hormone and genetic samples.